Tell us a bit about how you formed as a band? ​Will (Guitar) and Lee (Bass) have played together for years. Back in 2008, Will posted a flyer in a guitar shop’s bulletin board in College Station, TX. This was before the days of Craigslist so if you wanted to find a band you had to go looking around these sort of gathering places to find like-minded cats. Coincidentally, the first ad Will placed for a band happened to be the first flyer Lee ever responded to. Written out in black ink on a sheet of printer paper: “Rock/Blues/Metal Guitarist looking for band”. From that point on the two drifted in and out of bands over the years meeting again and again. Finally, in 2015 Will moved to Dallas-Fort Worth (where Lee had been living for five years) with the prospects of forming a band with Lee and going all the way. 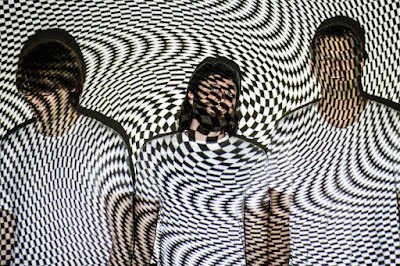 The two planned to make a full-length album, press a vinyl record and tour everywhere. ​By this point Craigslist became the standard method to find musicians. Will discovered Ben (Drums) and the three felt out the abilities and vibes of one another until everyone agreed that it was the band we wanted. The group sought out additional singers and keyboardists but failed to find a singer of practical means, and we also lost our keyboardist due to mental illness. We refused to quit and forced Lee into the role of singing after the studio time had already been booked. 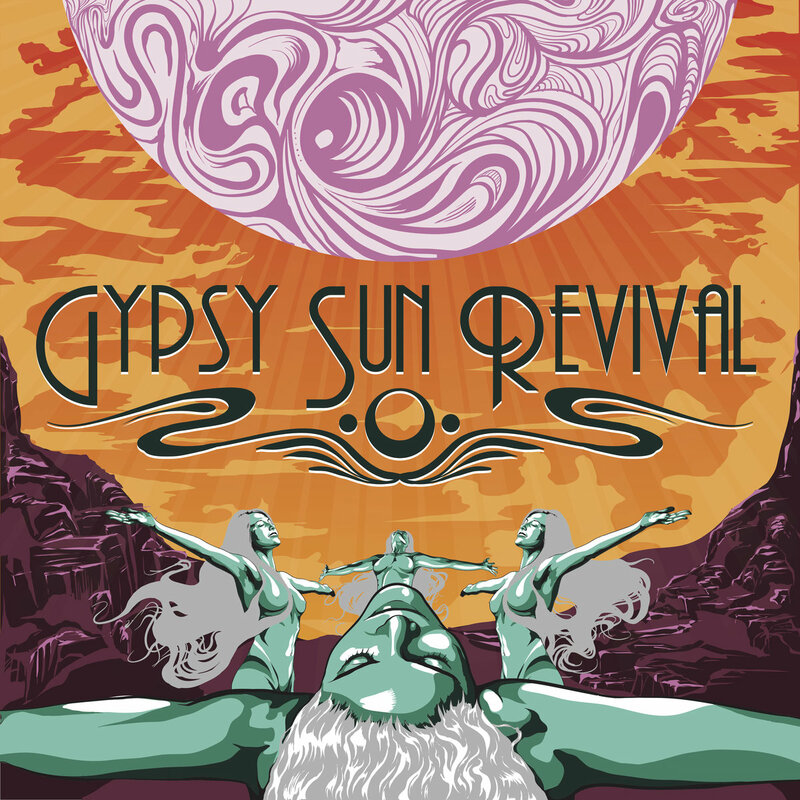 With the band’s line-up complete, we named ourselves “Gypsy Sun Revival” in homage to Jimi Hendrix’s later works. We believe in Jimi’s philosophy of creating music akin to an “Electric Church”, where listeners don’t just casually listen. We want people to truly have an experience. What is the psychedelic scene like at the moment in Texas? ​To begin, Texas is a big state. The psychedelic presence in DFW is marginal but we are slowly finding bands that are in tune with our wavelength (shoutout to Same Brain and Smokey Mirror!). There are enough people here to get our band up and running to face the world. Crystal Clear Sound was a huge factor in our ability to make the record we wanted. This is due mostly to the people running the recording studio. Kent Stump and Michael Walter of Wo Fat deserve credit. Not only is the equipment at this studio totally colossal, but their insight into how to make a record with a psychedelic sound-scape was invaluable. Mood, space, textual layers and funk rhythm all accumulated in this studio to escalate our levels of performance. ​The real heart of the psychedelic movement lies in the southern/central regions of Texas. Austin, San Marcos and San Antonio are a hot bed for some of the most radical and successful acts coming out of this State. This is the region where the Black Angels are kings. This genre of music has grown to such popularity that the Black Angels have been hosting an annual festival, known as Levitation, on Carson Creek Ranch. Before it was named Levitation, they simply called it: Austin Psych Fest. This three day event is like a holy pilgrimage of the greatest psychedelic acts all over the world. Also there’s Utopia-fest which is even more obscure and way out west of San Antonio in the hill country. We are actively trying to play these festivals. How has the response been from your recent live shows? ​Our first show occurred on the second floor of this DIY punk venue/hippy commune/library. They received our music with great enthusiasm. We held the crowd for the entire set. There isn’t a huge psych scene in Dallas-Fort Worth, so it’s hard to find like-minded bands to gig with. However, we’ve been gigging regularly and our music appears to be well-accepted. We’re gaining more and more popularity every gig. Avenues such as It’s Psychedelic Baby are a great way for people to find out about what we do and come see us live. Can you give us a list of influences? ​Lee: ​​Black Sabbath, ​​Pink Floyd, Sleep, ZZ Top, ​​Deep Purple, ​​Led Zeppelin, ​​Metallica, The Sword. ​Will: I think the classics are too obvious. I’ll try and stick with some more modern influences. There’s so many great bands out now. Its unbelievable: ​​Earthless, ​​Black Bombain, ​​Samsara Blues Experiment, Causa Sui, ​​Colour Haze, ​​The Machine, ​​Dead Meadow. 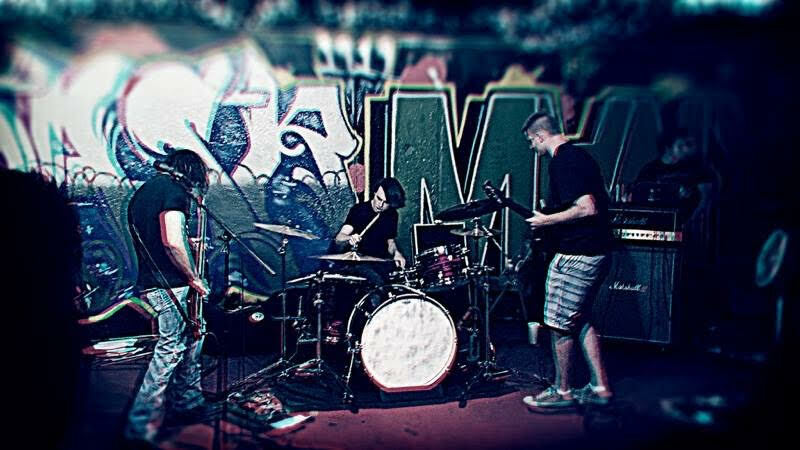 Ben: These bands specifically influenced my playing style: ​​Black Flag, Sabbath, ​​Blue Cheer, Hendrix, ​​Dead Meadow, Electric Wizard. 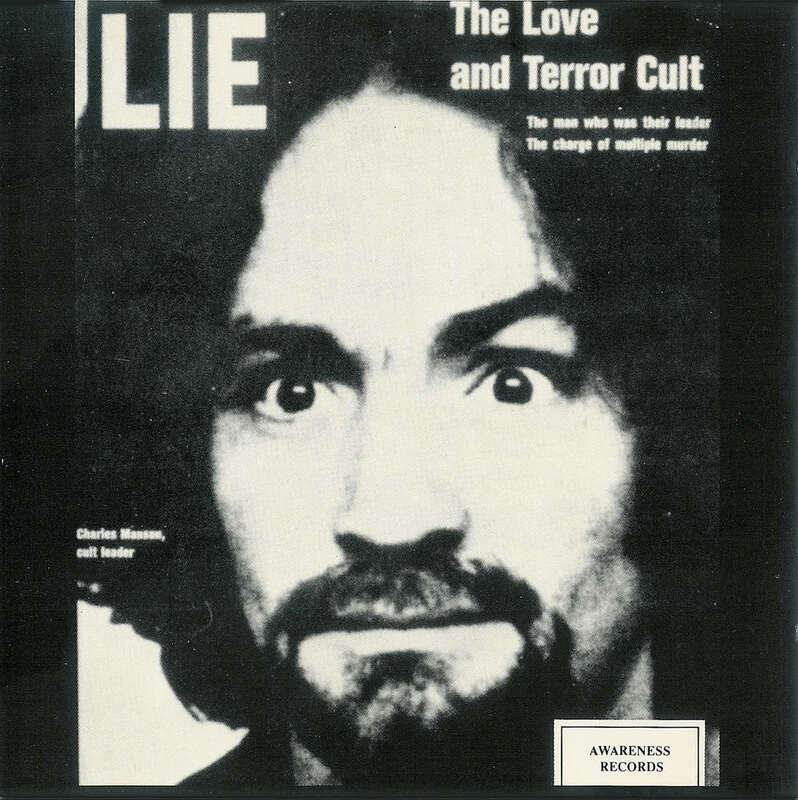 You recently wrote a letter and sent a copy of your new album to Charles Manson. Who’s idea was that and have you had a response yet? ​HA Yes! It came to us between songs during rehearsal. We talked about who could do a critical review of our album and Ben jested we have Charles Manson write a review of our album. It’s rich you know because he actually wrote and recorded a lot of music in his early days to attract followers. We haven’t received a reply. We doubt he ever got a chance to listen to it. There is a team of prison workers that filter all the mail he receives so it likely got thrown in a dust bin, but who knows, maybe we’ll receive a reply soon. Tell us about the recording process for your debut album? As stated earlier, we recorded at Crystal Clear Sound with Kent Stump behind the board. We recorded ourselves playing live in the studio to get the vast majority of the music down in one or two takes. We highly believe in recording as a complete band, meaning that everything is mic’d up and we all play the songs together as if we were playing live. Crystal Clear is geared towards this method of live tracking because they have such a big studio to isolate all the instruments from each other so we can play in the same room like rehearsal sessions, but not have them bleed into each other. It’s pretty cool how we had a tanpura in its own isolation booth droning away while we jammed. We recorded all of the instrumentation in two days and got the vocals tracked separately on the third day with the last four hours of studio time we had left. We definitely felt the pressure to get these songs nailed and by the end of the session we managed to get the last two songs recorded in one take. That was fortunate. Looking back, we didn’t spend more than 3 takes on a song. Our attitude is that if we try to make something perfect it’s going to sound sterile. You can only get a song tracked in so many takes before it starts to sound worse and worse. We also feel the enjoyable quality of this music comes from the mood it creates and not so much the technical flash. Not to discredit ourselves, we are always practicing to grow as musicians and master our instruments. Lee had only been singing for 2 or 3 months before recording his vocals, and we have to give him a lot of credit for that. We also have to thank Kent on this one again. He gave Lee a lot of direction to get a halfway decent vocal track down. We had some fun adding on extra layers of guitars and theremins at the end of the second day. Will has this old tape delay box (echoplex) that’s 40 years old and learned how to pull all sorts of radical sounds out of it. That’s part of his Earthless influence. Isaiah Mitchell (guitarist from Earthless) uses and recommended an echoplex to Will. Nothing beats real, tape echo delay. Lee built a guitar amp that Will used for some extra guitar layers. We also threw some Hammond organ on some of the songs to give more textures to the soundscape. Stuff to fill up space and inject more color into the listener’s brain. It was a blast to try all this creative stuff. ​The mixing phase also had some fun elements. We added some sounds from NASA, that are open-source to the public, to give it a little bit more of a “spacey feel”. Those are the little “bleeps”, “blurps”, and random bits of radio chatter that you hear. We ran the final mix through ½ inch tape to give it a more palatable texture and warmth to the sound. I really like Idle Tides on the album do you each have favourites? Will – Idle Tides was the first song that we wrote for the album. I’ve been playing the main riff of that song for probably 3 to 4 years, and with the bands help, we were able to create a song out of it. To me, it kind of has a Robin Trower feel to it that I really like. That’s probably my favorite song on the album. Ben – My favorite is Radiance. We jam that one so hard at the end, it gets really weird. It also features the theremin. Lee – I also have to go with Radiance. It has such a far out, exotic sound and creates a transcendental mood. To me, I feel the song captures the majesty and mysticism of the sun. It has this shimmering brilliance and simultaneous darkness that’s really interesting. It’s a great closer for the album to sum up everything we are going for with this band. New sounds, different scales, different instruments, different song arrangements. It’s a total psychedelic freak out that can be itself with no limiting rules. What is your writing process as a band? ​It typically starts with a riff. Usually Will or Lee will have an idea or some sort of riff/lick they’ve been working on. From that starting point, we just jam relentlessly until we have some sort idea of where we want to take the song and what we want to do with it. In our opinion, the best song writing is completely spontaneous. For example, the riff on Solar Breeze was a complete accident. Will just played a few notes and we all looked at each other like “that was cool”. It ended up being one of our most popular songs. It’s really neat to see a simple riff take on a whole new life after we jam and create a song. ​After we get a jam going we have to organize it and arrange it into an ordered structure so we all know what to play. This process involves writing out the riffs. We don’t write music on staff paper but rather give a riff or a lick a specific name like “ Riff A, Riff B, Riff C, Bridge”. Then we establish how many times we play each riff. Sometimes sections of a song can be more abstract and we have a part of a song that’s called “drum break into space jam” or “walk-down riff”. It doesn’t matter so long as we all know what we’re talking about. This might sound elementary but it is the most vital aspect to making a song that breaks out of traditional molds. So many bands don’t take the time to communicate these arrangements and it traps writing into simple, predictable patterns. It also accelerates how fast the whole band can memorize a song. Effective communication is probably the most important aspect of creating good music. As for writing lyrics, Lee focuses on colorful imagery involving the cosmos. Mysticism and inner development of the mind also make up the subject matter. Like the jams, most lyrics are written on the spot in a rehearsal session and they seem to come out the best that way. ​We have a small, cheap recorder that we use to record all of sessions. Sometimes it’s very obvious how the songs should be arranged, other times we listen back to the jams we recorded and it becomes clear that a song is suppose to take a certain direction or be arranged/played in a certain way. The creative process is something that we have come to really enjoy. It gets us excited and keeps us going. If you could have any other artist guest on your next album, when there is one, who would it be? Will – For me, that’s easy. I gotta go with Isaiah Mitchell from Earthless. I think he is criminally underrated as a guitarist and probably one of the best guitarists to ever live. HIT ME UP MAN! Lee- Billy Gibbons. Who else could be cooler. Ben – Jus Oborne from Electric Wizard.